So almost immediately upon landing in Australia I had it in my sights to find a good Lamington, explaining to a group I was with it appealed so much to be because it had my three favorite things stacked into one: chocolate, coconut, and marshmallows. There was only one problem – that’s not what a Lamington is. Was my face red as I sat amongst a group of food-savvy Australians, who quickly corrected me, and set me straight about me what a proper Lamington is. They started to tell me that it’s not really something that you buy, but more like something you might make at home. Or if you buy one, you get a pre-packaged supermarket version. (Which sounds like an Australian paradox, but is probably similar to what their counterparts said in the United States about cupcakes a decade or so ago.) So when they described a Lamington – spongecake layered with jam, sometimes, and chocolate icing, then topped with shredded coconut – it sounded like something that would be infinitely better than the packaged versions I subsequently saw in grocery stores. (I love going to grocery stores in foreign countries and always tried to hit at least one during any visit.) And yes, I discovered on the supermarket shelves that even Weight Watchers Australia has their own version, too. 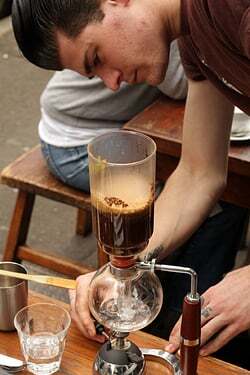 Matt Rothman is the cook at Single Origin Roasters and everyone in Sydney pointed me in his direction. And even though my sixth grade teacher told my parents in a pointed note that I was not good at taking direction, I proved her wrong and decided to head over to Surry Hills to check them out. (See? I just needed the right motivation.) 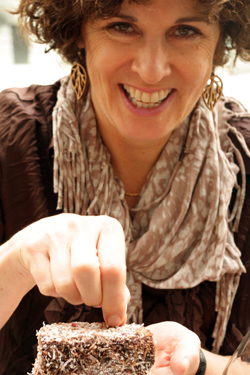 So I made a date with Australian food writer Jill Dupleix for a Lamington liaison. Except I cheated and went to Single Origin the day before and met Matt, and we had a nice chat and he explained all the fresh, vibrant food he was preparing for the modest café next to the coffee bar, or “Sideshow” as they call it. In the back of my mind, I kept thinking “Why doesn’t he come to Paris and do this there?” since I don’t know of any coffee shop (or even a café) that’s making things like savory zucchini blossom and duck egg muffins, a warm croque monsieur proudly stuffed with free range local ham, and pork hock sandwiches served on house-made pretzel rolls – all prepared by his truly, in a kitchen only un peu larger than my puny kitchen in Paris. So once I get a view of the Seine, he said he’s up for an apartment swap. In the meantime, Sydney is lucky to have him here, and depending on who you talk to, Paris is luc …um—well, let’s just say I’m tolerated. 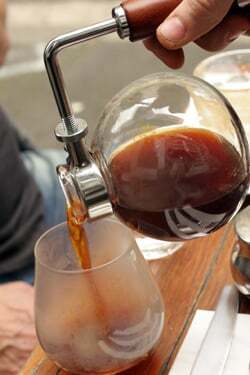 We tried every kind of coffee they make, from cold-brewed coffee, to splitting a small pot of siphon coffee, made tableside. 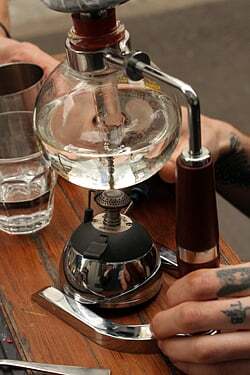 I can’t say I’m wild about siphon coffee in general – it always reminds me of a coffee version of tea – but the espresso marked with a touch of steamed milk that I enjoyed went nicely with Matt’s Lamington. Which brings me to the Lamington. I’d bought one a few days before at another café, before I knew I was coming here, and it was just okay. 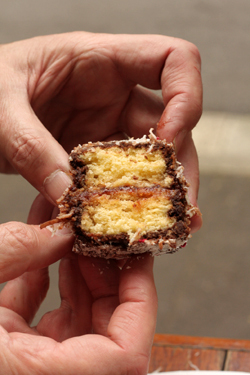 But when I took my first forkful of the Lamington at Single Origin, my quest ended right there, on a Sydney sidewalk. His special touch was mixing homemade jam with chocolate for the filling, which continued the chocolate theme from the glazed exterior right to the center of the matter. A few dried raspberry bits added a colorful touch to the outside, and it was hard not to eat both of the rectangles of cake that he prepared for us. They were great. I’m not sure what days – or how often – the Lamingtons are available, but if you’re looking for a good one, you can’t do any better than here. And am not sure that if we swapped places and Matt came to Paris, they’d enjoy the success there that macarons seem to be having here in Sydney. But I think if folks in Paris had a choice, his Lamingtons would give a few bakeries a run for their money. So if you ever see Lamingtons in Paris, you’ll have me to thank. And of course, Matt as well. So glad that you tracked down a truly great lamington. There’s another version of lamington, not as common as chocolate, which is the raspberry kind. The cheapest ones are just dipped in red jelly, then rolled in coconut, but occasionally you can find ones that are dipped in syrupy raspberry juice, and they are divine.When I make them at home, I use the juice that’s dripped out of a pack of frozen berries (’cause I hate to waste anything in the kitchen) and add a little softened gelatin. So glad that you are enjoying Sydney. It always strikes me when I’m there how much great food there is, but also how attractive the people are. Maybe they just swim and surf off all those trips to the Bourke St. Bakery! Sad that you’re not making the puddle-jump to New Zealand. We have the best dairy products in the world (or at least to rival Ireland’s). Love the story, but I have to say, I have NEVER in my entire life in Australia seen a lamington for sale in a cafe! OK, maybe some old fashioned country cafes of the Ye Olde Shoppe variety, but never in Sydney and I haven’t had one for years! 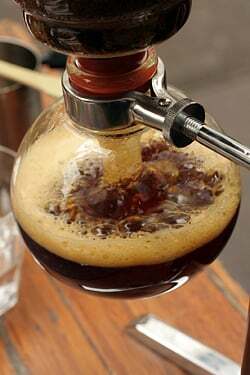 Incredibly nostalgic for them just looking at your photos though, so I’m going to barrel over to Single Origin and investigate. You are definitely not the first to be confused about a Lamington. Those, Anzac biscuits and pavlovas seem to be things that don’t make it out of Australia. I’ve been really enjoying reading your view of Sydney’s food scene. Living here you sometimes forget how good we have it. Hope your experiences of Sydney continue to be as positive as they have been. I love lammies! 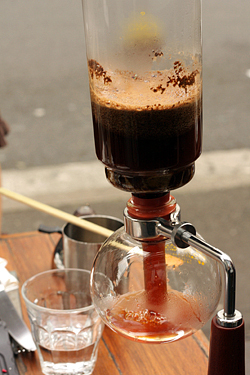 Nice bong…er coffeepot! It looks absolutely great! I hope you enjoyed it and let me say that the small spongecake looks devine! @Jess – I ate pavlova at a restaurant in Brussels! It was so bizarre visiting another country that had it. I was judging at our Royal Show last week and there were some gorgeous looking homemade lamingtons there. I didn’t get to taste them as I was judging jams and chutneys, but homemade or from the CWA (Country Womens Association) tea tent at a country show are really then only places to get great lamingtons as a rule. Yay that someone is finally doing a great one in a cafe. Someone in Perth, please listen!! Im dying with all your recipes!!! Im doing ALL of them, begining NOW!!! Love ittttt…. Mmmmm! I discovered lamingtons just last year, after seven whole years in New Zealand – my colleague mentioned them, got shocked that I didn’t know what they were, and shot out of the office to get me one from a bakery round the corner. The lamingtons you write of in this post sound gorgeous though! And won’t you consider coming down to NZ after Australia? Contrary to popular belief, we are not the same country…! And we’d love to have you visit. Like all the other Aussies I’m enjoying hearing about our fair land from your perspective. Lamingtons are a unique treat and I think loved by everyone. My brother is working in Sweden at the moment and baked (well, assembled) a whole lot of lamingtons for his colleagues… the Swedes loved them! Ha, you really do need to do Melbourne next time you come ‘down under’ Pim had an absolute blast when she was in Melbourne. We don’t have the harbour, but we sure have the food and coffee, and the laming tons! 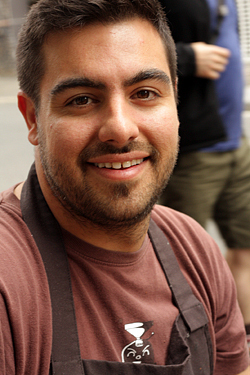 Shandel: It was very kind of the Crave Sydney Food Festival to be a guest chef at their conference. I had a wonderful time here and ate well. If there is one in Melbourne that invited me, I’d be happy to go. The lamington is one of those classic cakes that appear in our mothers’ tattered recipe books but is not famously sold at bakeries in South East Asia. I only revisited it when I was in Melbourne/Sydney last year. The ones from Queen Victoria Market’s deli section are quite good, though this one with chocolate in between and those dried bits of raspberries makes me want to bake some right away. I am so happy you enjoyed Sydney. However for a truly superb lamington and some amazing wine you really need to come to South Australia. We have ‘Cocolat The Bakery’ . Their lamington is layers of perfect sponge sandwiching gorgeous smooth white chocolate champagne mousse. Then dipped in chocolate ganache with flakes of toasted coconut on the outside. Sorry but until I compare it with the Sydney one I have to give the local one first prize, not that the Sydney one doesn’t sound amazing. Up til now I was feeling really proud of living in Sydney, but alas the lamington is our point of disagreement. (I have textural issues with desiccated coconut.) Hope that Sydney continues to impress despite the rain. And if you have time to check out the falafel at Jasmin’s in Lakemba then go nuts! We always take people to eat the toum there the night before an international flight..
Karen (NZ) – red ones are ‘Jelly Cakes’ not Lamingtons, these are usually made in patty pan tins, (not cut from a sheet cake), and are usually filled with whipped cream, after being dipped in jelly (mostly raspberry, but sometimes passionfruit or mango) and rolled in desiccated coconut. I have been following your Aussie sojourn courtesy of my friend Michelle. I am so pleased you found lamingtons. I am going to have to make some a la Matt since I am so far away from home. I hope you also took in Auburn and Cabramatta as I did last month when in Sydney. Such a treat. Then there’s the Flemington Markets – what a wow after the dearth of proper markets here in Scotland. David, thank you. I’ve never been one for unthinking-and-in-your-face patriotism (and I’m still not!) but your posts are making me so happy and proud of Australia. Thank you for liking us so much. We truly love you too. It doesn’t get much better than the lamington, my friend. So glad you discovered. We used to call the ones with jam and mock cream in the middle ‘lamington sandwich’. I made my last big batch on the day my husband got his Australian citizenship… good with dark chocolate ..
along with pavlova and blueberry coolie, anzac biccies…and some savoury goodness. might add it to the recipe to-do-list. I was recently asked what my favourite cake was – a very difficult question to answer! But it didn’t take me long to reply that it was the lamington. I have fond childhood memories of eating these little cakes and I now regularly make them for my husband and whenever his family from France come to visit. They love it so much that they will have a slice at breakfast, lunch and dinner! When I was a child (a very long time ago in the 70s) lamingtons were usually bought from what was called “lamington drives”. Organisations like scout groups would spend a day making cake, and then rolling it chocolate and coconut. It would be a fundraiser for them. They were fantastic! They were sold by the dozen. Thankfully I live in a country town where the local scout troupe still does an annual lamington drive. They are the best lamingtons of the year! I buy a few dozen and if the family leaves any I stick them in the freezer. What stunning photography! You make food look exactly as it should…simple, beautiful and clean.I would love to try Lamington in my home. hi david, your dedication to track down a proper lamington is to be applauded. i am kind of sad that i did not manage to get my hands on a real one. i must confess that i did try the supermarket kind as my friend insisted that i could not leave australian soil without trying a lamington once. suffice to say it was not the experience i was after all. was it woolie’s supermarket that you went to? i thought i was the only one who had a penchant for checking out supermarkets in different countries but glad to know that i am not alone. Jill actually brought along a supermarket Lamington, so I’d have something to compare it to. I could see the ‘nostalgic appeal’ of them, but they didn’t compare at all to the real deal. The only problem is – now I’m hooked! God, this looks good…I am seriously thinking about taking the next plane to Sydney. mmm I love lamingtons, i’ve only made them myself a couple of times though. i first heard of them from my grade 12 travel and tourism teacher who happened to be australian, so she brought them in as a treat for us one day! but check this out dave, it’s a bit closer to my roots! it’s the croation version of a lamington! That actually sounds like a good lamington. Cafes all over Melbourne have them, but any that I tried never seemed worthwhile when compared to the florentines right next to them. That looks like it was made just for me! My three favorite flavors in the world…chocolate, coconut, and fruit jam. You’ve set me now on a quest to either make one of find one. How about a recipe David? Or a place in NYC that might make these? So THAT’s what a real Lamington is? Looks wonderful. Love the dried raspberries sprinkled on top. Why don’t you compromise and make your chocolate macarons into lamington macarons, David? Sounds fun. Adore the design on these coffees. The lamington looks tasty, but it’s the coffee that’s making me want to hop right back into my car & head out for a latte. Your AU posts are making miss even more my friend who moved back to Melbourne from the US 10 years ago. David, can you post the recipe for Lamingtons? Please???? They look gorgeous! One more tip for you! 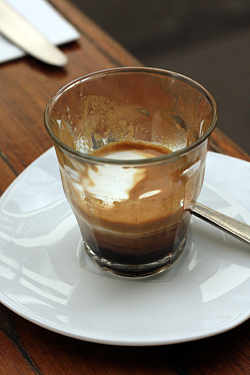 Don’t miss the affogato at Campos Coffee in Newtown. 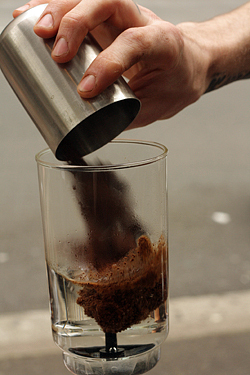 I dream about that affogato. Seriously. 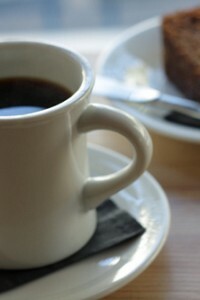 I’m not one for cakes so my main attraction to read this post are the stunning photos of COFFEE…. in all forms and sizes – love, love, love the mini cappu and the coffee in the glass… AND the zucchini flowers… I discovered them in Italy when I took an intensive course of Italian – I even planted them in my mini garden just for the flowers – such a delicate and ephemeral delight! David, your blog just stuns me every time. You are a joy. thank you and please don’t stop. PS: I have missed you twice in San Antonio,Texas because I was out of town. 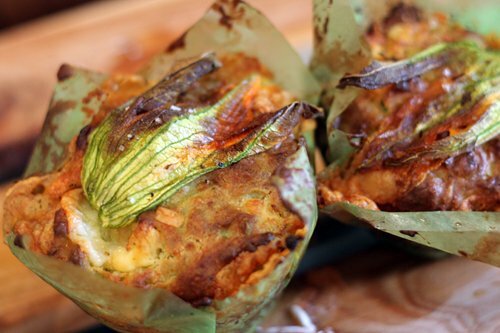 Would love to know more about the zucchini blossom/duck egg muffins. Fill cupcake pans halfway with muffin batter, make a little well in the top, crack in an egg, top with cheese & blossom, bake? That’s my guess from picture – do you know? If you have nieces or nephews, or if you yourself ever read kids’ books, Opossom Magic by Mem Fox is a great book to commemorate your Australian trip. The book mentions lots of Australian foods (lamingtons, pavlova, minties) and cities/towns. I remember watching a cooking show 30yrs. ago where Helen Reddy,the singer who is from Australia,made Lamingtons. I tried them because they had all the ingredients I love:coconut,chocolate and cake. I don’t remember the marshmallow though. I’m going to make them again! I just did a little research and it seems that in the USA they’re called Clevelanders or just plain ol’ Coconut Bars and there’s a bakery in Tarzana, CA called Bea’s Bakery that makes Coconut Bars. I will have to go there and try one! I have tried a few Lamingtons here in London, and wasn’t overly thrilled. Perhaps they just weren’t the right ones. However I do really like the Anzac biscuits and the friands I have tried. 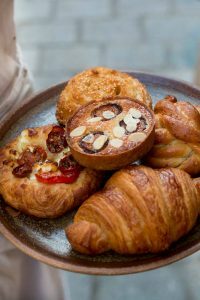 Friands only seem to be available at the Antipodean cafes I have been to. Have you come across any of those David? Lime and blueberry are my favourite so far. For anyone who likes coconut then try seeking out the ‘cheesecakes’ available at some bakeries in London. They are an old style pastry, made with flaky pastry and filled with some kind of squidgy creamy filling, probably meant to symbolize cheese, and coated with long curls of coconut. There is a bakery very near me who makes superb ones. It is hard to find them though. I remember, when living in Paris I had an Australian friend who once made lamingtons every one loved. Just know, after having read your article I realized that during my travel in Australia I did not see a single ones, well you have given the explanation in your post. And even better, the place where to get some, next time. Those muffins with zucchini blossoms and duck eggs look gorgeous. That is such an original idea! 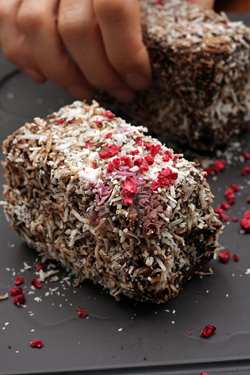 Never heard of lamingtons before but how can you go wrong with cake, chocolate, coconut and jam? I will duck for cover now but just a reminder to you – please visit New Zealand for the ‘real deal’! Seeing that Lamington brought back a wonderful sweet memory from my childhood of coconut bars that I ate as a child as a special treat- white cake rectangles with chocolate and coconut flakes, just as in your photo. What a quick trip back 60 years. Thank you! Seems to me you’re having a pretty fine time here in Oz, David, and I’m glad you managed to track down a decent lamington. The prepackaged variety available in supermarkets are not really indicative of the genre and the very best are home-made. I haven’t made them for years, though, as it is a pretty messy business. Maybe your minders should find a CWA (Country Womens Association) lady for you to meet – they are stunning bakers and cooks whose skills with lamingtons, cream puffs and scones can’t be beaten. I’m so glad you’re in Australia. I’ll be there in Jan and I hope we have many dispatches from down under. Oooohhhh, Sydney’s Lamingtons look almost like America’s raspberry Zingers, except w/o the chocolate. I’ll be there better, though, but in a pinch . . . Wait, hold up. THEY DON’T SERVE CAFE AU LAITS IN FRANCE?? Are you kidding? So all these years ordering my fav drink, refusing to call it a damn “misto” a la Starbucks, imagining all those tres elegant French folks sipping on the same coffee with milk that I prefer…they don’t do that in Pah-ree? My world view has shifted. We made lamingtons at the Rose Bakery (in Paris), once. But Rose used chocolate cake instead of vanilla and that just made this particular Australian homesick. These sound so yummy. Perhaps you’ll score us a recipe? Glad to see you’ve discovered lamingtons. As a couple of people have said – the best lamingtons are those made by the CWA. The CWA is an old stalwart of many country towns and while they do many things other than baking, such as fundraising for health services and being quite a powerful advocate for the country, they are most famous for their scones, sponges and jams. My Mum grew up on a farm a fair way out of town and her mother was definitely a CWA women – Mum once commented that store-bought ice-cream was a treat, because they always made it at home! I looked up the recipe a few weeks ago for a house lamington bake-off and this recipe from SBS was the best: http://www.sbs.com.au/food/recipe/367/Lamingtons. It’s a bit of an odd sponge recipe, but feels like it melts into this air the moment you bite into it. In my search, I also came across the judging standards for CWA baking competitions (http://www.cwaofnsw.org.au/committees/theLandCookery.do) – you can tell these ladies are serious when the rules state that no rack marks or ring tins are allowed! I’m loving reading about your adventures and I hope you enjoy the lovely sunny weather today. Hi Francesca: Thanks for that information and link to the recipe. When reading it, several readers noted there were issues (perhaps typos?) with it. The main one being that folks thought it was supposed to have flour in it, perhaps self-raising flour, instead of the cornflour (corn starch). Did you make it with cornflour or self-raising, or regular flour? 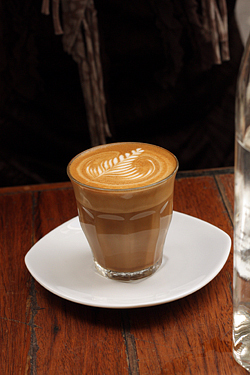 It sounds like you’re having a delicious time….and now I’m craving a latte! Oh strewth I thought I was immune to homesickness. Not so much the lamington drives which I remember with much neighbourly fondness, but the Sydney cafe scene – unbeatable!! I prefer the plain Lamingtons with tea. Thanks for the reference to “Clevelanders”. I hadn’t read your entry, Jinjer. I grew up in a Cleveland suburb, where I had the pleasure of these coconut bars! I get my mum to post me Anzac biscuits to Paris every January. Want to go halves? And lamingtons… long lost memory. Please try to find one of the Australian Women’s Weekly cookbooks – preferably from the 70s – with all the classic Aussie biscuits in a beautifully kitsch manner! Glad you enjoyed them, David. I have such great childhood memories of my mum making trays of lamingtons for us to sell to raise funds for my primary school – a lamington drive as mentioned above. We’d offer them to all our friends, and walk up and down our street asking our neighbours to buy them. People always bought at least one tray because it is very hard to resist freshly baked lamingtons. David, thank you so much for this post. I spent a whole year in Sydney back in my twenties, loved every minute of my time there. Seeing these lamingtons just takes me right back to those warm, easy breezy auzzie days. It’s funny how, like music, food always reminds us of our special memories. Thanks mate! Oh Lamingtons! In the early 80’s, my high school field hockey team from upstate NY went to Oz for a few weeks of playing games and traveling around Sydney, NSW and Perth. After every match, the hockey club parents would pull out the tables, load them with food and fill the barbie with sausages. Lamingtons appeared at every match and I became a full fledged Lamington taster in a short amount of time. I tried them all and have continued searching in further AU and NZ journeys over the years. So happy you’ve had a taste! Lucky you, so glad you are trying such fab places. Another superior version can be found at the Book Kitchen (opp Bourke St Bakery in Surry Hills) and Bronte Bakery, a retro Aussie cake shop. While you’re in Bronte you could try Iggy’s bread. Hope you have time to make it further afield, Vietnamese in Cabramatta (Marrickville if you can’t make the trek). And if anyone takes you to the Blue Mountains check out the Common Ground cafe and bakery, it’s run by some devout religious people but there Barra burgers are the benchmark by which all others are judged (and fall well short). 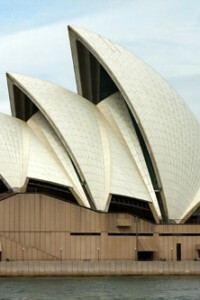 Loving your Sydney posts – didn’t realise I was such a Sydney-centric but it’s so nice that you’re here! If you’re still in Sydney you MUST go to Yellow Bistro in Potts Point. Lorraine Godsmark is simply the best pastry chef in Australia. I have never tasted cheesecake like hers, not to mention her amazing chocolate cake (it took her years to develop the recipe – I took her class) and her famous date tart. 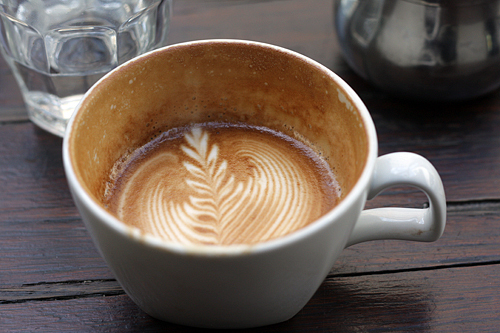 Those coffees are a piece of artwork in themselves…everything is so yummy looking! Just a historical clarification, it’s well documented that lamingtons were invented in Queensland by the chef of Lord Lamington, governor of Queensland. The recipe crossed to New Zealand at some point. Does it really matter anyway? Most lamingtons sold in bakeries are too large, dry and flat tasting. I have heard many say that these ones are amazing though, and Manna from Heaven’s version is supposed to be quite good as well. Okay, I’m thoroughly starving here. The lamingtons sounds lovely and amazing, but can we talk about the zucchini blossom – duck egg muffins and sandwiches served on house-made pretzel rolls?? I don’t even eat red meat, and those ham-y delights sounds irresistible! Shame on your sixth-grade teacher for the trauma she caused you! But thank you so very much for the trip to Sydney. I’ve always wanted to go. Wonderful to read of your time in Sydney and to see that you are being directed to some great places. The ‘Lamo’ – as you will have perceived from so many responses to your story, this little cake touches straight through to the heart and memory of childhood for many Australians, much like Proust’s madelaine dipped in tilleul tisane. The equivalent here would be a glass of cold ‘Milo’…. Two lamo stories – I consider myself so luck to have as a memento of my beloved Grandma her little green bowl we used to make the chocolate icing for lamingtons in together. Worth nothing but worth the world. And, we lived in country France for several years where the locals were quite reserved/suspicious/shy of us foreigners. We cracked this when we made a big batch of lamingtons for an event at our son’s ecole primaire. Such a success in a land of fabulous cakes! I had to translate the recipe and hand them out…..
Lamington looked ok…but I am more interested in the coffee..it looks like an interesting process, after all I am from Washington state. The best ones I’ve ever had are made at Floriditas in Wellington – rather than the traditional chocolate or strawberry ones, they’re iced with lemon icing. The lemon glaze dribbles into the sponge a little before it sets, so as you eat the lamington you get little sparkles of lemony sweetness – heaven! Needless to say, some clotted cream on the side is a must.